Can’t wait one more minute for the next episode of THE FINAL SEASON of Game of Thrones? 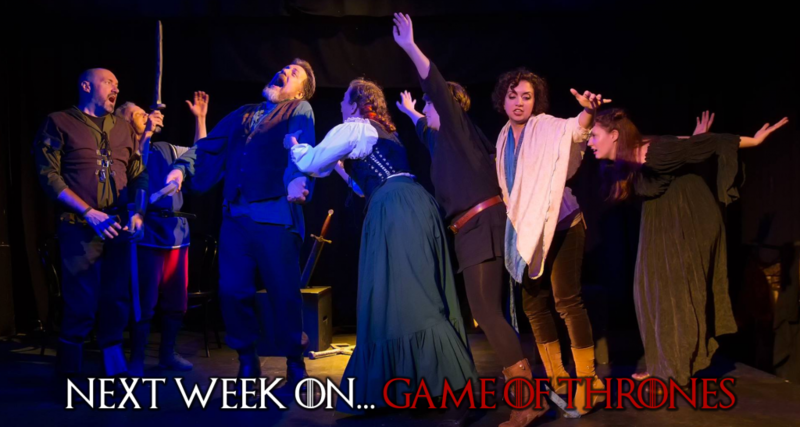 Look no further because every Sunday night at 7:30pm the Hideout Theatre improvises the next installment of Game of Thrones a full hour before the actual episode HBO episode airs. Then audiences can stick around after the improv for a free viewing party of the actual episode at 9pm. Winter is HERE, and every week is a completely new episode beginning, middle and end, featuring all of your favorite characters as we discover what exciting, intriguing and possibly fatal adventures await them. We’ll be taking suggestions from the audience, so if you think you know what should happen next or have a funny idea, come help us decide what happens in this week’s episode! How will the fate of Westeros shake down? Who will sit on the Iron Throne? Can those crazy kids Jon and Dany make it work? Who gets to ride the unclaimed third dragon? Should we still be hype for Cleganebowl? **Don’t forget to stick around for a FREE screening party of the actual episode (with suggested drinking games).